Looking for ways to use frozen veggies? 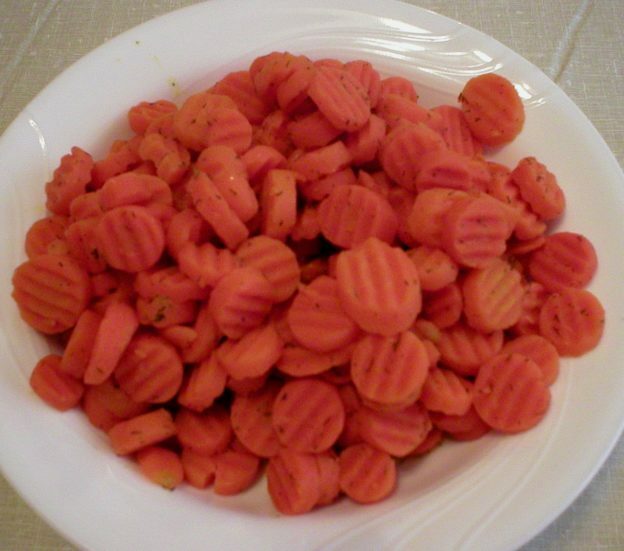 Here’s a simple recipe using frozen carrot slices to make Easy Orange Glazed Carrots. Below is a video demonstration of how to make the carrots. Below the video link is the written recipe. Enjoy! Melt butter in a medium size pot. Add orange juice, honey, and ginger and allow it to warm up enough for the honey to blend in. Add the frozen carrot slices and bring to a boil. Lower the heat to simmer. Allow it to cook until the carrots are as tender as you want and the liquid is reduced and slightly thickened. Do not allow it to dry up, as the sauce is what flavors the carrots! This may take from 9 to 15 minutes. Sprinkle the dill weed on top and stir to combine. Enjoy! * Carrots can be used in this recipe while frozen. However, the sauce will have a deeper orange flavor if the carrots are thawed first by running warm water over them while they are in a colander. Allow them to drain well before using. ** Use less juice if you like more “bite” to the carrots and don’t want to cook them until soft. This entry was posted in Food and tagged easy carrot recipes, easy orange glazed carrots, recipes using frozen carrots on March 26, 2019 by Judi. 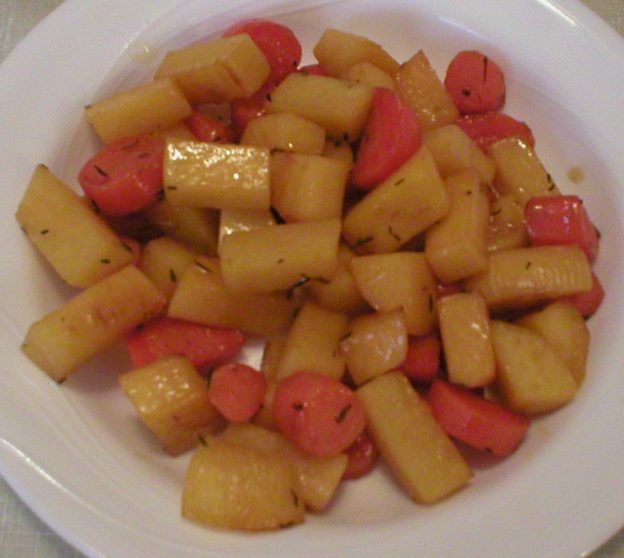 If you’ve never tried rutabagas before, this is the recipe to start with. The maple syrup brings out the natural sweetness of the carrots and rutabagas. You can use honey if you prefer, no problem! It’s easy to make and really delicious! Below is a video demonstration of the recipe. Following the video is the recipe. Enjoy! Heat a skillet over just above medium heat. Melt butter in skillet. Add prepared vegetables and sprinkle them with salt and thyme. Sauté the vegetables until they start to brown, about 6 to 7 minutes. Add about ½ cup of the water and the maple syrup; stir. Place a lid on the skillet. When the water starts to boil, lower the heat to a simmer and monitor the water level closely. Allow the vegetables to cook, adding more water as needed until they are as tender as you like them. If there is still water in the pan when the vegetables are cooked to your desired tenderness, remove the lid and allow the water to evaporate, leaving a light glaze on the vegetables. Remove from heat and serve. Can be garnished with more thyme, if desired. Tip: The carrots will cook faster than the rutabaga, so it’s helpful to cut the rutabaga into smaller pieces than the carrots to have them all cook within about the same amount of time. This entry was posted in Food and tagged easy carrot recipes, easy rutabaga recipes, maple glazed rutabaga and carrots on February 21, 2019 by Judi.